Over the last decade, direct lenders have become a significant source of funding for mid-market companies. But as forecasters grow wary of another downturn, questions remain as to how these new lenders have prepared for dangers ahead, and how they might approach any potential workouts. 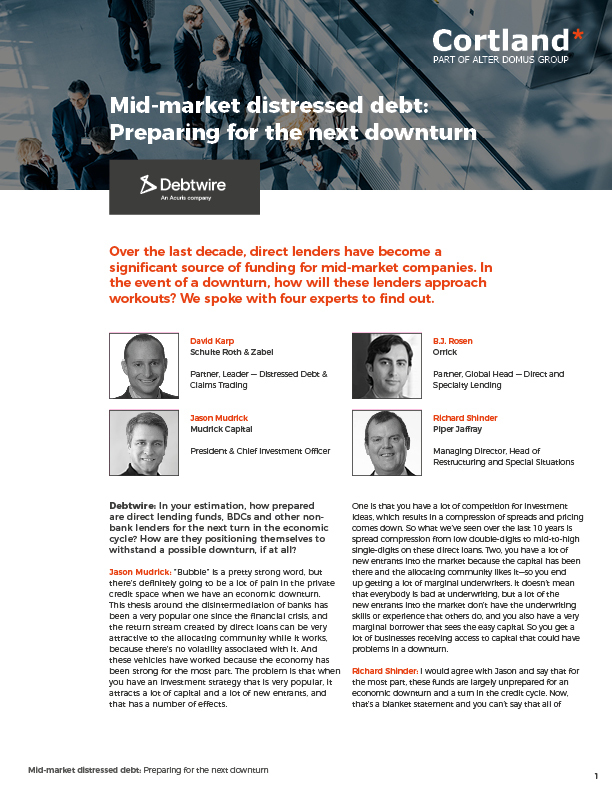 To find out how private debt funds are expected to fare in a future downturn, and to learn about the opportunities that may arise for distressed investors, Debtwire, on behalf of Cortland Capital, spoke with four experts. How prepared are direct lending funds, BDCs, and other nonbank lenders for the next turn in the economic cycle? How prepared are the current crop of lenders and borrowers for workouts if they become necessary? Which types of investors are expected to be best positioned to take advantage of potential distressed opportunities that could appear if/when the cycle turns?